Sherrie is a winemaker in Paso Robles at Castoro Cellars where she gets to work with 30 varietals from their organically and sustainably grown estate vineyards along the Central Coast. Not only are the growing conditions diverse in Paso Robles, the winery is very diverse too! Besides the 35,000 cases produced for Castoro Cellars, the winery is a 4 million gallon custom crush facility and has a mobile bottling line company. Most recently, Castoro Cellars also started distilling organic grappa, brandy, gin, and fruit liqueurs under their Bethel Rd Distillery label. 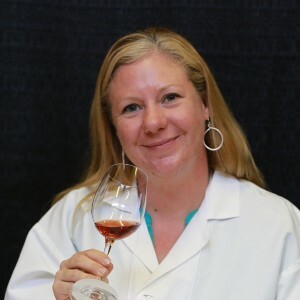 Sherrie earned her Wine Business Management Certificate from Sonoma State and her Enology and Chemistry degrees at Fresno State. Her love for sensory and flavor chemistry was born at Fresno State as an enology student. She spent much of her time there helping to develop Fresno State’s first Professional Wine Sensory Evaluation Panel. She led and trained all of the panelists for descriptive analysis and difference testing on research and commercial wines. After graduating college, Sherrie’s interest in sparkling wine and Pinot noir took her up to J Sparkling wines in Healdsburg where she spent a harvest. Although she loved the Russian River, she knew that the Central Coast is where she wanted to settle and rear a family. A year later she moved to Paso Robles to begin her winemaking career. When she’s not up to her ears in grapes, Sherrie can be found running through the vineyards training for her next marathon or playing volleyball.